Scientific AmeriKen - How Human Are We? The purpose of this experiment is to examine just how applicable the world of science is to us. As seen on TV, DNA is used to track criminals, identify the true father, and recreate the dinosaur - and within the scientific community, the sequence of 3 billion Human DNA bases is essentially known. With so much knowledge about what is virtually invisible, one has to wonder is any of this real? IS there really DNA inside of ME? The question of this experiment will be simplified down to two parts. The first is whether or not a particular sequence of DNA can be copied out of Scientific AmeriKen. The second part is whether the sequence from the copied section will be the same as the sequence in the Human Genome Database. Based upon previous experiments demonstrating super human abilities (10 story cardhouses, destroying chess computers, Boulder tossing, ect.) it is the hypothesis of this experiment that DNA can be copied but there will be differences compared to the human genome database, thus explaining the "mutant abilities." Copying of DNA from the genome of Scientific AmeriKen is done through a process called PCR. Click on the link to see a video of this process. In short, PCR works by creating short DNA sequences, called primers, that surround the region to be copied. Protein machines then copy the region flanked by the primers millions of times over to yield the sequence of interest. These copies can then be sent to a sequencing facility to identify the sequence, then compared against the human genome database using a sequence alignment program (MAFFT). The specifics are as follows: Pipette tip was scraped along inside of mouth then swished in 100 ul of water. This was then boiled at 95 degrees for 10 minutes and centrifuged for 5 minutes at 16,000xg. 35 ul of sample was than amplified using PCR with Phusion? polymerase [Forward Primer: caccctggttccgcgtggttctcaggagcggatcaaggcg / Reverse:aaatgtttgcaactgctgc ]. 1 ul from this reaction was again amplified with PCR. The sample was extracted from the agarose gel, purified and sent for sequencing. 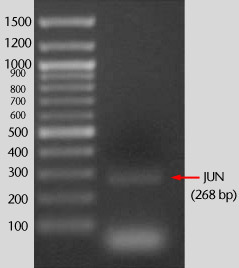 The target sequence in this experiment is a 268 bp fragment of the gene Jun. The first step in this process is the amplification of the target sequence with PCR. After the PCR is complete, the sample is analyzed through agarose gel electrophoreses. This technique allows for the size of a DNA fragment to be deduced by comparing the sample of interest against a reference sample. The figure on the right indicates that the expected fragment was amplified through PCR. Finally, the sequence of interest can be compared against the sequence in the human genome database (link) to look for possible differences (Figure below). The two sequences were compared in a DNA alignment program (MAFFT). The results appear as though there are no mutations between the Jun gene of Scientific AmeriKen and that which is known for Humans. Lack of matching in the first line is most likely due to the limitations of DNA sequencing that usually do not allow for accurate information of the beginning of a sequence. Through the analysis of this data it appears as though the hypothesis is wrong and there were no superpower mutations found within this gene. Though it should be noted that this search looked through only 260 of the 3,000,000,000 bases of the human genome. Larger implications of this experiment, however, is the ultimate acceptance that the common everyday person, including Scientific AmeriKen, has within them DNA and ultimately it appears that THEY might be on to something.